Will Ana join the new drama-thriller «Joint Security Area»? According to a Deadline post, which has been deleted, Ana de Armas (Blade Runner 2049) and Demián Bichir (The Hateful Eight) are set to star in drama-thriller JSA, screenwriter David Franzoni’s (Gladiator) reworking of hit Korean film Joint Security Area, which was directed by Park Chan-wook (Oldboy). Franzoni has scripted and will direct the feature about the love affair between a U.S. Marine and a female Spanish infantry lawyer (De Armas) who is sent by The Hague to investigate a shoot-out between Marines and Mexican special forces.It is scheduled to go into pre-production this coming fall. We tried to find more information on this project and couldn’t find any yet. For now, this is only a rumor but hopefully more news will appear on this if it goes through. We can finally see the official trailer of The Informer aka Three Seconds! Ana plays Sophie Hoffman, Pete’s wife who’s played by Joel Kinnaman. Ana is the protagonist of the third short film, “Entering Red” of the series “Red Hands” by Campari, which premiered on February 2019. 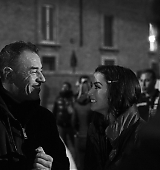 The short film was directed by Matteo Garrone, and was shot in Milan. Lorenzo Richelmy , known worldwide as the Marco Polo of Netflix, and Cristiano Caccamo join the short film as Ana’s costars. Following the philosophy of Campari for which “every cocktail tells a story”, Entering Red not only tells an intriguing story, but is also an ode to the famous Negroni, cocktail symbol of Campari, which celebrates its centenary in 2019. 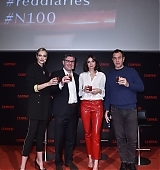 The premiere and red-carpet of “Entering Red” will be held in the hometown of Campari, Milan, February 5, 2019 , in conjunction with the worldwide launch of the digital.